Menu 01 provides an animated rotation icons menu for your design. It works by RotationMenu CS technology and create smooth animation effect. With the real time blur, alpha, mirror effect, and customizable speed, acceleration, you can create your unique rotation menu by simply entering parameter. Save a lot of workflow time when use with Adobe PhotoShop. 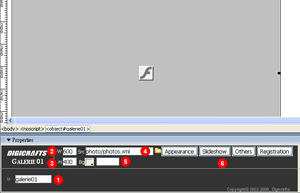 Galerie 01 supports build gallery from PhotoShop. 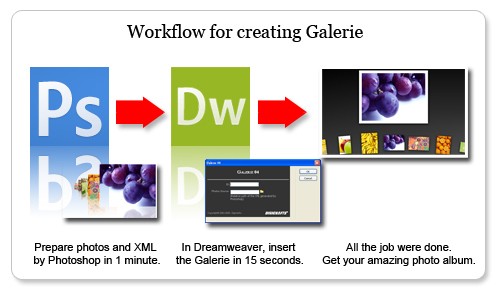 Use the Export Web Gallery function in PhotoShop and use the gallery with Galerie 01. Event Generator included in the Menu 01 Extension. Developer can simply defined their own function when the menu click, roll over, etc. All listener script are defined in the extension to minimize the workflow of developer.